The Skinny: Engaging "cop soap opera" that's involving in a low-key, character-driven way. A surprising, well-constructed tale of Generation X cops chasing a mad bomber in Tsimshatsui. The cops are your general types with individual issues. One (Marco Ngai) is a gambling addict with a suffering girlfriend (Ng Yi-Lei), while another (Chan Kwok-Bong) is a single parent raising a son. Moses Chan is the new rookie who starts a subtle romance with hospital patient Dolphin Chan. And, Jordan Chan shows up as the brash young cop whose attitude masks certain insecurities. 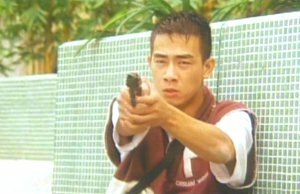 Writer James Yuen's loose plot basically follows the characters as they balance their personal lives with the chase for the bad guy (Ko Kin AKA: Jack Gao), who really isn't a psychopathic criminal. It turns out that he's simply a guy having a bad day, which doesn't mean that people are necessarily going to get off easier. image courtesy of Fitto Moblie Laser Co.